There are also the 80 odd books that Johnson refers to in a 1735 letter to Gilbert Repington that he wished to have sent to him from Oxford as the basis for the library at Edial. How many of these later followed him to London, one can only guess at. I didn't remember reading anything in Boswell's Life of Johnson about a personal library of books that Johnson brought with him to college at Oxford. Nor were these books mentioned in any of G. B. Hill's numerous notes either. A. W. Hutton didn't mention them in his talk on "Dr. Johnson's Library" before the Johnson Club on June 11, 1892 (later reprinted in Johnson Club Papers, London and New York, 1899). 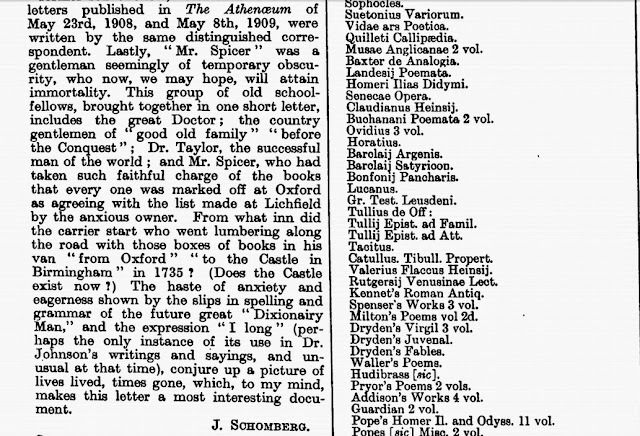 Nor did Austin Dobson mention them in his article on "Dr. Johnson's Library," which appeared in The Graphic on Oct, 8,1892 ( later reprinted in Eighteenth Century Vignettes II as "Johnson's Library" in 1894). I grabbed Vol I of the Hyde Edition of the Letters of Samuel Johnson 1731-1772 down from the shelf and read Johnson's letter to Repington. Johnson mentions writing a catalogue of the books on the other side of the letter. But the catalogue does not accompany the rest of the letter in the Hyde Edition. Instead, there is a footnote, which reads "The catalogue lists eighty-six items, which are described in detail by A. L. Reade (Johns. Glean. V.214-29)." In late October 1728 the nineteen-year old Sam Johnson and his father took the eighty-mile, two-day journey to Oxford on horseback. A wagon lumbered behind, carrying Sam’s meager personal possessions and a substantial library of more than a hundred books in Latin and English. Despite the often strained relations of father and son, they both valued these books, which had depleted Michael’s stock (31). He had brought with him to Oxford a library of almost a hundred books, more than all but the most learned would have read by the time they left. But for him, they were books to be read for amusement, not tomes to study: what he read solidly at Oxford was Greek; not the Grecian historians, but Homer and Euripedes, and now and then a little Epigram (27). I disagree with David Nokes's opinion that Johnson's books were "books to be read for amusement, not tomes to study." As Jeffrey Meyers pointed out, these books depleted Michael Johnson's stock. Would Samuel Johnson have depleted his father's stock for amusement only? He wanted the books for study at Oxford and would later want them for his students to study at the school he started in Edial. 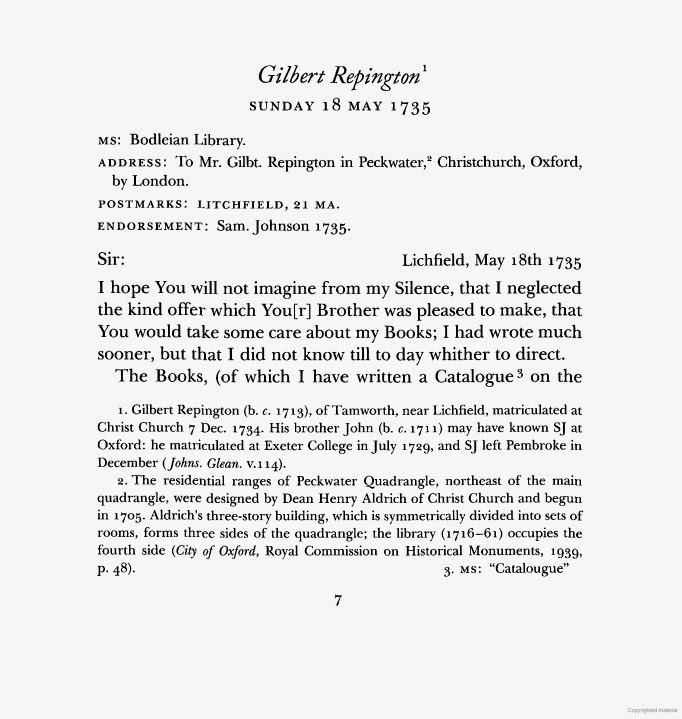 The best evidence we have of what Johnson was reading shortly before and during college is a list of books he wrote on the back of a letter to Gilbert Repington, a friend of the friend with whom Johnson left his books when he departed from Oxford in December 1729 (92). 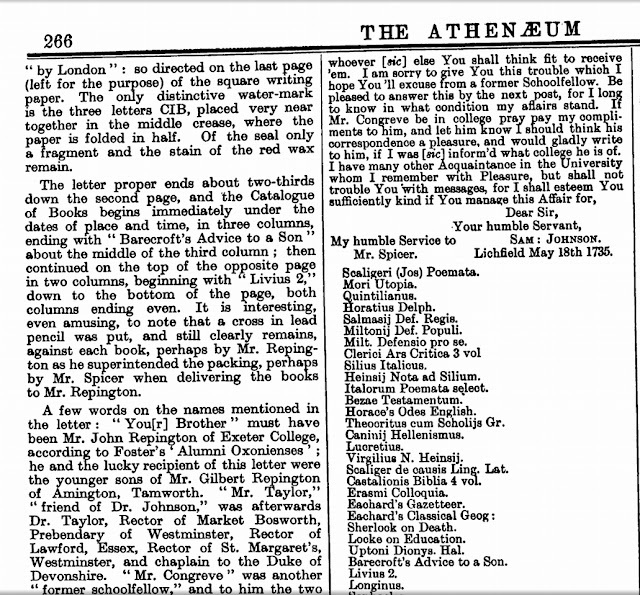 The reason why James Boswell, George Birkbeck Hill, A. W. Hutton, and Austin Dobson didn't know about the books Johnson brought with him to Oxford was because they didn't know about Johnson's letter to Repington. Gilbert Repington forwarded Johnson's letter to Richard Congreve (Johnson had asked about Mr. Congreve in the letter). And the letter remained undisturbed in the Congreve Family papers for 174 years. Mr. Spicer was a gentleman seemingly of temporary obscurity, who now, we may hope will attain immortality. 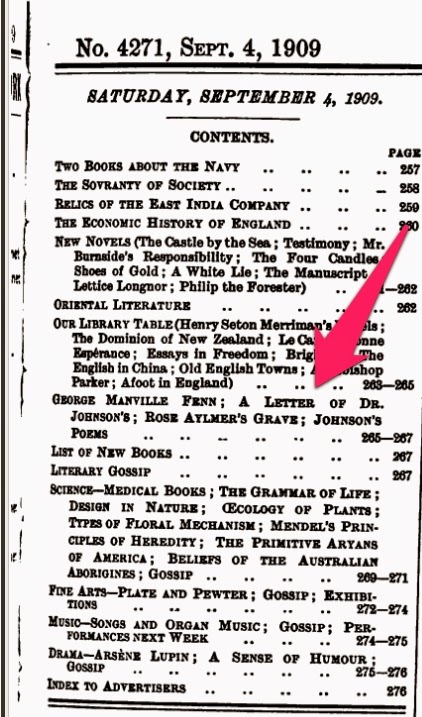 As far as Johnsonians are concerned, Miss Julia Schomberg appears to have been reduced to two footnotes in Johnsonian Gleanings, Part V, nary a footnote in the Hyde Edition of Johnson's letters, and seemingly, not a word of acknowledgment by Jeffrey Meyers, Peter Martin or David Nokes in their biographies of Samuel Johnson.. Miss Julia Schomberg had previously sent The Athenaeum two other Johnson letters she discovered in the Congreve family papers, one on May 23, 1908 and another on May 8, 1909. 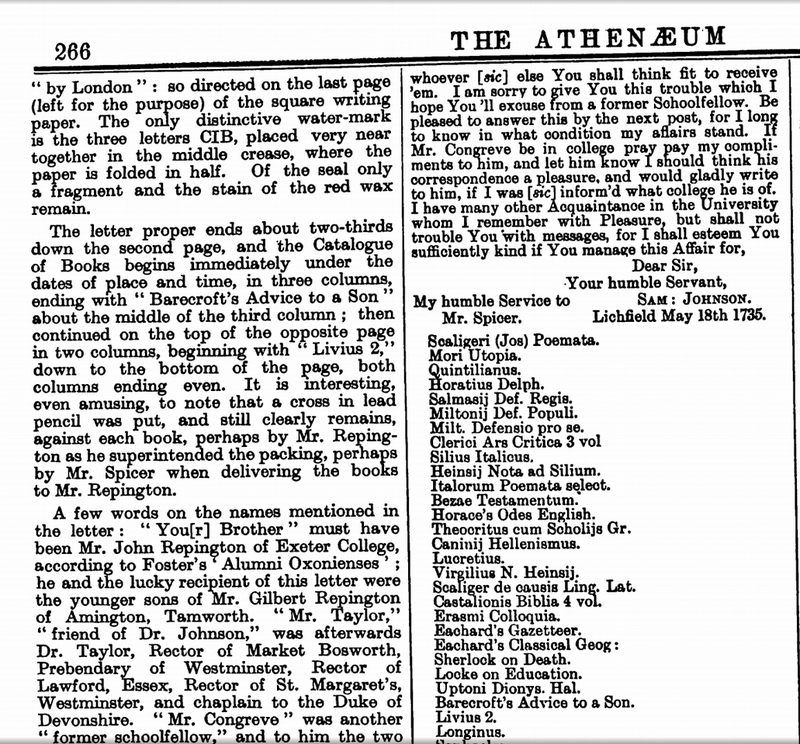 From what she wrote in The Athenaeum articles, she knew more than a little about Samuel Johnson, having researched Boswell's Life of SJ as well as "the sale catalogue of Dr. Johnson's goods." Her own interesting papers are filed in the national archives at the Staffordshire County Record Office, along with the records of the Congreve family. 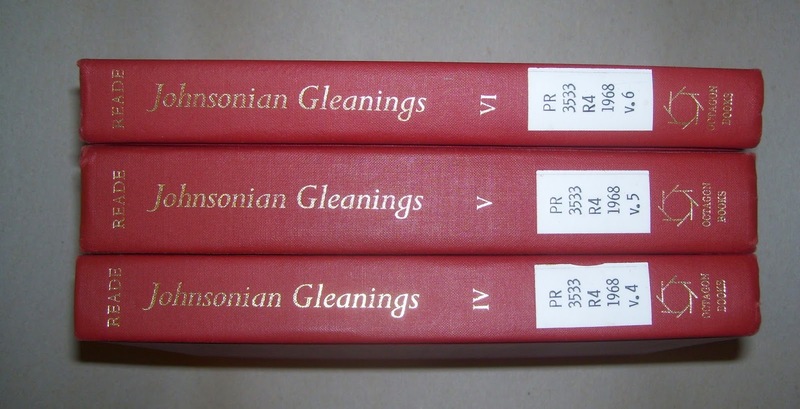 A. L. Reade published Part I of Johnsonian Gleanings in 1909, the same year Miss Julia Schomberg sent Johnson's Letter to Repington to The Athenaeum. 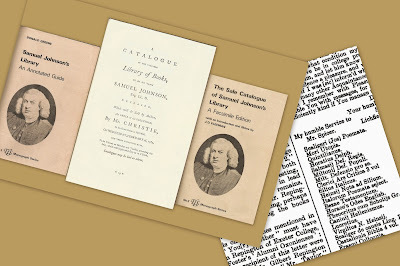 Reade would spend a lifetime researching the life of Samuel Johnson, privately printing Johnsonian Gleanings in eleven parts from 1909 to 1952. Reade's papers at the University of Liverpool, Special Collections and Archives, indicate that he contacted the Congreve family at least once (in 1918). Part V: The Doctor's Life: 1728-1735 was first published in 1928 and set the record straight on Johnson's days at Oxford, including how long he was at Oxford. 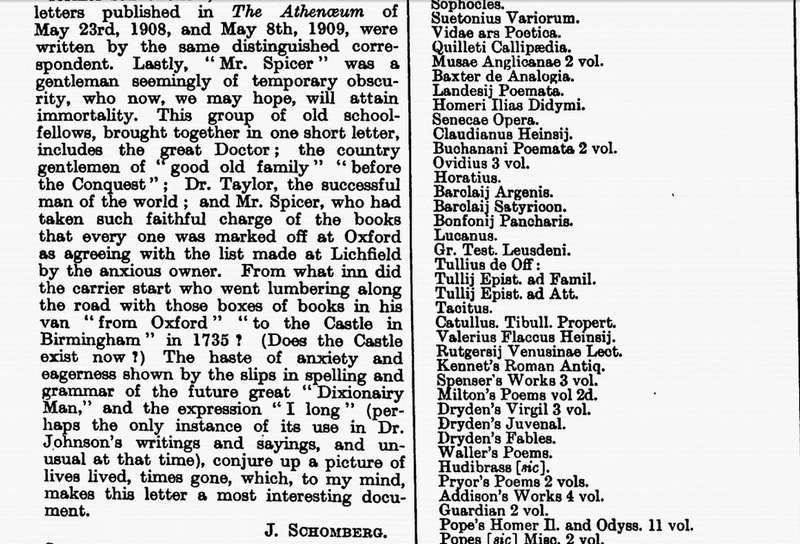 And in Appendix K of Part V, Reade identified all but one of the books Johnson brought with him to Oxford. Reade dubbed the books "Johnson's Undergraduate Library." He mentioned that he had identified many of the books himself, but required the help of L. F. Powell, Taylorian Librarian at Oxford, Dr. Henry Guppy, Librarian of the John Rylands Library at Manchester, and Mr. Leonard Whibley, Fellow of Pembroke College, Cambridge. Reade's catalogue of Johnson's Undergraduate Library can be viewed online at Archive. org. Vol II only. Undergraduate Library listing reads: "Milton's Poems Vol. 2D." In Appendix K of Johnsonian Gleanings, Part V, A. L. Reade wrote: "We can scarcely identify this edition. It is of interest to know that Johnson the undergraduate had some of Milton, whom he quotes frequently in the Dictionary." It is difficult, even today, to sort out Jacob Tonson’s editions of Milton’s Poems. He published Paradise Lost and Paradise Regain’d separately in numerous editions. And he combined them in a one-volume folio edition in 1695 under the title, The Poetical Works of Mr. John Milton. Jacob Tonson published two-volume octavo editions using this same general title in 1705 and 1707. The general title, however, was printed on the half-title pages only. The title page of the first volume of the 1705 and 1707 editions contained the title, Paradise Lost, while the title page of Volume the Second contained the title(s), Paradise Regain'd, Samson Agonistes, and Poems Upon Several Occasions. In 1720, his nephew, also named Jacob Tonson, published a two-volume quarto edition—but the general title, The Poetical Works of Mr. John Milton, was printed on the title pages of both volumes. In addition to Paradise Regain'd, Samson Agonistes, and Poems Upon Several Occasions, Volume the Second also contained A Tracate of Education, a system of education Johnson discussed and Boswell recorded in his Life (Hill, III, 358). It stands to reason that Samuel Johnson may have had Vol the Second (2D) of either the 1705, 1707, or—more likely—the 1720 edition of The Poetical Works of Mr. John Milton, in his undergraduate library. But we must also remember that Samuel Johnson was the son of a bookseller. And he may have considered Paradise Regain'd and the other poems published in the volume with it to be "Vol. 2D" of Milton's "Poems." In fact, Samuel Johnson owned a copy of the 1725 edition of Paradise Regain'd . . ., which is now in the Donald and Mary Hyde Collection of Samuel Johnson in the Houghton Library at Harvard University. Where might one read these "congreve family papers"?